Robert B. Piercy, II, B.C.O. Robert B. Piercy, II, B.C.O. began his ocularistry apprenticeship in Charlotte, North Carolina shortly after his graduation from the University of North Carolina at Chapel Hill in 2009. While pursuing a Biology and Medical Anthropology degree, Rob also volunteered at N.C. Children’s Hospital providing support to kids affected by cancer. Whether it was helping a nurse with a procedure or simply providing a laugh in the playroom, he was always eager to lend a helping hand. After 3 years in Charlotte, NC, Rob moved to Los Angeles, CA to pursue his ocularistry career further in a larger group practice. Beginning in 2013, Rob joined Ocular Prosthetics, Inc. under the guidance of director, Stephen E. Haddad, B.C.O.. B.A.D.O. 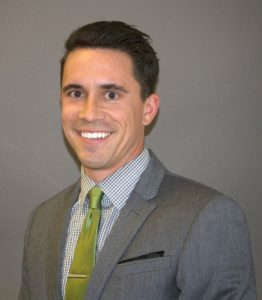 While working as an associate ocularist, Rob was able to collaborate with board certified team members on complex cases involving trauma, cancer, and motility peg enhancements. His successful training resulted in an American Society of Ocularists Board Certification in 2017. As a journeyman ocularist, Rob has learned a wide array of advanced fitting techniques to enhance the look and feel of a custom prosthetic eye. Through the years, he has found a passion for creating the most lifelike scleral shells available. These extremely thin, impression fit, prosthetic eyes are worn over an existing blind eye. Similar to a large contact lens, a scleral shell fits over the iris and sclera; completely masking any irregularities such as strabismus, discoloration, or volume loss. Rob is available to see patients in the Los Angeles office location. With prior approval, special arrangements can be made to complete the prosthesis in one day. To schedule a consultation online, please fill out the form on the Request Appointment page.